It is this time of year again, when I dream of pancakes. I love preparing the batter and flipping the crepes in the air. I also love the classic fillings but look forward to new ones. However today I have another type of pancake in mind: katayef. 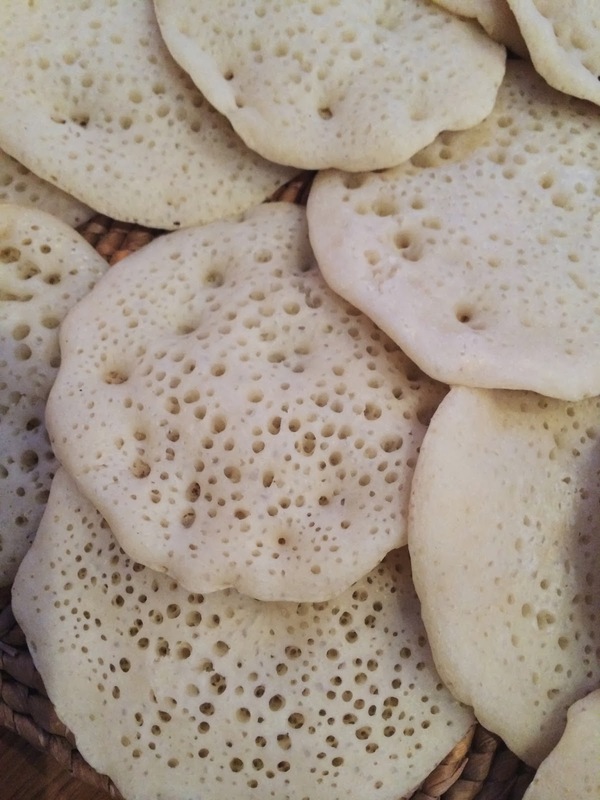 Similar in texture to English crumpet, katayef is much thinner and soft enough to fold over the your chosen filling. In Lebanon, it marks the end of feasting and the beginning of Lent. There are several fillings to katayef: nuts, cream or ashta (made with the cream that collects on the surface of boiled milk). The pastry is shaped in rounds, filled and folded into half-moon shapes. It keeps in an air tight container in the fridge for two days. 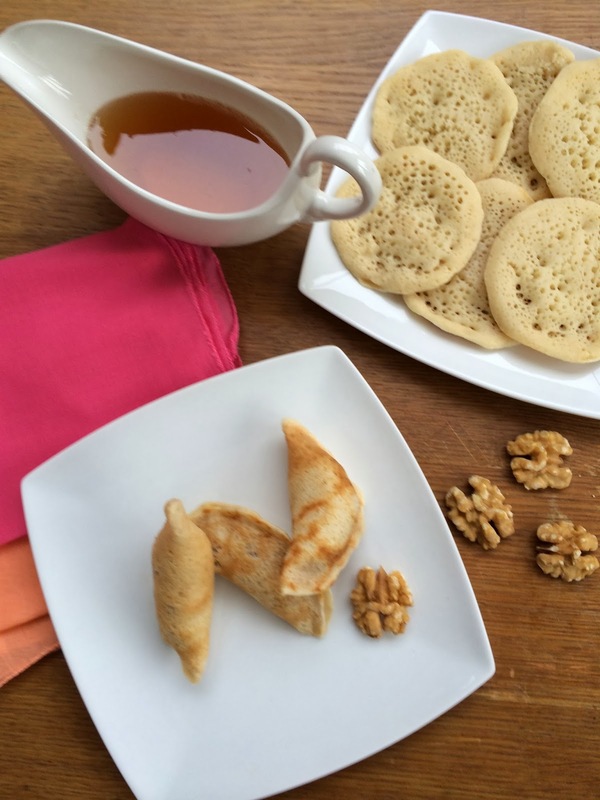 You can serve Katayef bi Jawz or with walnuts either just as they are when you finished making them, syrup is optional or you can fry them in a little vegetable oil, until they brown a little and become crisp. At this point, if you lace them with a trickle of syrup they are even more scrumptious. Enjoy! Dissolve the dried yeast in a small bowl with warm water. Stir in the sugar and leave in a warm place for about 5 minutes or until frothy. Place flour and baking powder in a deep bowl. Add water and yeast mixing well with a balloon whisk to prevent any lumps from forming. The mixture should be the consistency of single cream. Cover with a cloth and allow to rest for at least 10 minutes. Meanwhile prepare the syrup. Combine sugar, water, lemon juice and honey together in a pan and bring to the boil, stirring until the sugar dissolves completely. Simmer over medium heat for 10 to 15 minutes or until the liquid thickens to a syrupy consistency. Flavour with orange blossom and rose water. In another bowl, coarsely crush the walnuts. Add sugar and orange and rose water. Set aside until ready to fill the pancakes. Lightly grease a non-stick frying pan with a little oil and place over medium heat. Whisk the batter vigorously for a couple of minutes before cooking. Heat the pan and grease it lightly with oil. Pour about half of a ladleful of batter in the centre of the hot pan. With the back of a spoon, lightly spread the mixtureut to get a perfect round. The batter will start to form bubbles and dry. Do not turn it over. Cook for about 30 seconds to 1 minute or until the base is golden brown and the top is dry. Remove to a tray. At thois stage you may want to bring the heat down and keep it down. The base of the pancakes should remain golden and not charred. Repeat until all batter is finished. Leave them to cool and cover them with cling film. To fill the pancakes, take a teaspoon of walnut filling and place it in the centre of the pancake, then fold it in half to a half-moon shape. Pinch the sides together gently.